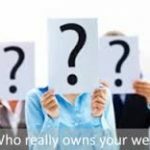 Who Owns Your Website Domain? 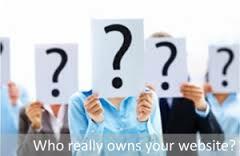 When we meet a new client, one of the first things we check is whether they own their domain, if they have one. “Domain” as in URL, or website address, like www.portisheadchamber.co.uk. Whilst it’s not often a problem, about one third of the sites we check are technically not owned by the businesses that use them. This usually happens because the person who first registered the domain didn’t understand the implications. It often turns out that the person who owns a domain is the staff member who started the ball rolling, or a website designer. This works fine – until you fall out with them. We’ve met several people along the way with real business problems because somebody else owned their domains. Here’s just one of them. Andrew co-owns a successful business with partner Beatrice. A new start-up in 1999, over 15 years they built a successful, UK-wide business. Their main sources of new customers are referrals and sign-ups from their website, driven by email campaigns and advertising in trade publications. The website ranks well in search results for many of their main keywords and phrases. They own two domains. The marketing site sits on a keyword-rich domain, focused on their target market. The domain name is partly responsible for the good search rank. Andy had registered the original domain, named for the brand and the business name, when they started trading. They used it only for emails. Andy wanted to expand the business overseas, but Bea thought it was already taking up too much of her life. To cut a long story short, somewhat acrimoniously, they decided to go their separate ways. Andy kept the business, intending to grow it overseas, while Bea went on to pastures new. They’d made a good team, he and Bea, had complimentary skills. Bea did most of the sales and marketing, whilst Andrew the admin stuff, accounts, IT and so on. She ran the website. She owned the domain, and was the only one with access to the necessary logins and passwords. What’s more, because they fell out, she was going to keep it that way, thank you very much. She took the website down. Faced with a total rebranding exercise, Andy asked for some help. Imagine, a re-brand, a new name, new logo, reprinting, new banners, a new domain, new email addresses… It doesn’t bear thinking about. Andy was very, very, fortunate. Whilst Bea managed the sales website, he did the rest. He controlled the office email domain. He also had backups of the marketing website on the office server. Within a couple of days, we had the website back up, based on the original business domain, reinstalled from the most recent backup. Email and advertising campaigns quickly got the situation under control. Naturally, after the domain name change, the site disappeared from search results. We submitted the new domain to the search engines and were very surprised to see how quickly they listed the site again. It took Google only a couple of weeks to recognise the content on its new domain. So, whilst there was work to do, it wasn’t the complete disaster it might have been. Would you be so lucky? It only takes a minute or two to check who owns your domain. Type or copy/paste your website address into this web page, at whois.com. They call the domain owner the “Registrant”. The data displayed is different for .com and .co.uk domains, and you may not be able to see it all. Look for the registrant. It should be your company name. You see a lot more information for .com domains than for .co.uk ones. A business or an individual may have registered your domain. Look for registrant type, or a person’s name as the registrant. Personal registrations may pay extra for “Domain Privacy” or “Address Opt Out”, which means you won’t be able to see the registrant’s contact details. If you can’t find out who it is by asking around, you’ll need to make a domain transfer request to the Registrar. The Registrar will contact the Registrant on your behalf. Let’s hope your domain is secure, and registered properly. If it is, there’s no problem. If, on the other hand, you’re one of the unlucky 30%, ask the current Registrant to transfer it to you. There’s more information here, including how to go about the domain transfer process, what it ought to cost, and what to do if you aren’t speaking with the current Registrant. New Members – What’s in it for You?